Church Slavonic is a rich and beautiful language used in the sung prayer for much of Eastern Europe. In the United States today most of these common services are available in English, but Church Slavonic is still a rich source for study and understanding for liturgy in these traditions. Certainly for cantors, readers and others with a serious interest in these liturgical traditions the study of Church Slavonic is a helpful element for spiritual enrichment and textual study. Fortunately, there are a number of resources available now in English. The field is not nearly as rich for English speakers as other fields of language study, but there is enough made available in the last fifty years to allow serious study for an English language student. While I am a novice level myself, this page provides a guide to some of these resources that I have found helpful. Church Slavonic is the liturgical language for Eastern Churches in Slavic regions ranging from Serbia and Bulgaria in the South through Finland to the north. There are various additional terms used to label Church Slavonic: “Old Bulgarian”, “Old Church Slavic” and “Old Church Slavonic” are the most common. These terms are most correctly applied to the form of the language prior to 1100. This is the conventional dividing line that scholars use for Church Slavonic literary codification. The difference is analogous to reading Chaucer in the original English as opposed to Modern English. Virtually all of the grammar resources and academic programs cover Old Church Slavonic, not Church Slavonic as used in current liturgy. Two Greek missionary brothers created Church Slavonic as a written language in the 9th century, SS. Cyril and Methodius. When they began there missionary work in what is now Bulgaria there was no written form for Slavic languages. They created the Cyrillic alphabet to capture the sounds of the local tongue and merged the local language with some Greek linguistic features to create a written language. They then proceeded to translate the bible and ecclesiastic material into this language. The earliest form of the alphabet is Glagolitic with the final form being Cyrillic. This is not exactly the same as the Cyrillic in use today which was simplified in Russian linguistic reforms in modern times. Scholars recognize three major recessions of Church Slavonic, Russian, Bulgarian and Serbian. The Russian is the largest in terms of usage area and population. Thus this recession receives most of the scholarly activity and attention. Each ethnic group using Church Slavonic does put their own stamp on the language, especially in terms of pronunciation. These variations are for the most part transmitted orally. The earliest extant literature dates from the 10th and 11th centuries. These are translations of biblical material for the most part. There is little in the Church Slavonic corpus of literature of wide scholarly interest because most of the material and virtually all of the early material is translations from other sources where the originals still exist. The major exception to this is “Slavonic Josephus.” There are Christian interpolations into the historical writings of Josephus, a first century Jewish historian, that are only preserved in Church Slavonic. See the introductory chapters of the grammars listed below for more information on the history and development of Church Slavonic. The core of any new language study is grammar and vocabulary. In the sections below we tour the available English grammars of Church Slavonic, which provides a great set of choices for the student. The section on lexicons describes the much less rosy state of Church Slavonic vocabulary aids in English. At the outset, one needs to understand that a grammar is a reference guide and not a textbook. Some of these grammars do provide elements of a class text within the grammar, but by and large, these are reference grammars not an orderly presentation of Church Slavonic for the learner. If you have studied another language pull out that textbook and have a look at how the language is presented. They will introduce concepts in grammar slowly along the way. You may want to use their order of presentation as a guide to your studies. Start with some liturgical prayers or the reading section in the grammar, create vocabulary lists and see how words are used. To this add a grammar study one at a time. I suggest starting with nouns then pronouns and moving on to verbs last. For the cantor to simply be able to find music or texts in liturgical books the ability to read Cyrillic and a basic vocabulary are an easy place to start. The following resources are PDF files of the basic notes used for Church Slavonic class in the early eighties at SS Cyril and Methodius Seminary. They provide a good starting point to get a feel for the structure of the language. Grammar Notes: This is a short summary of the grammar of Church Slavonic compiled in hand written notes by Father Chornyak. Note that the last page is a correction list with the correction and page number listed. This is setup on legal size paper and runs very close to the edge. You may have to play with your print settings in Acrobat to get a complete copy by shrinking the page size percentage and using print to fit on page. Titla (Abbreviations), Dipthongs & Vocabulary: Our liturgical books are full of short abbreviations called the titla. These are similar to contractions in English. They eliminate vowels and mark a word with a special symbol. These sheets provide a list of common titla used in Church Slavonic and what the original word was. Part two is a listing of dipthong pronunciations and usage. There is also a basic vocabulary list. I have also scanned in the titla section from Deschler’s lexicon. Pronunciation Guides: There is more than one way to pronounce Church Slavonic. 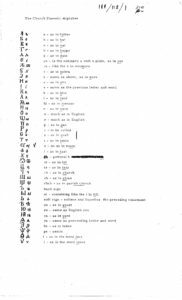 This PDF file collects the pronunciation sheets I have gathered over the years. 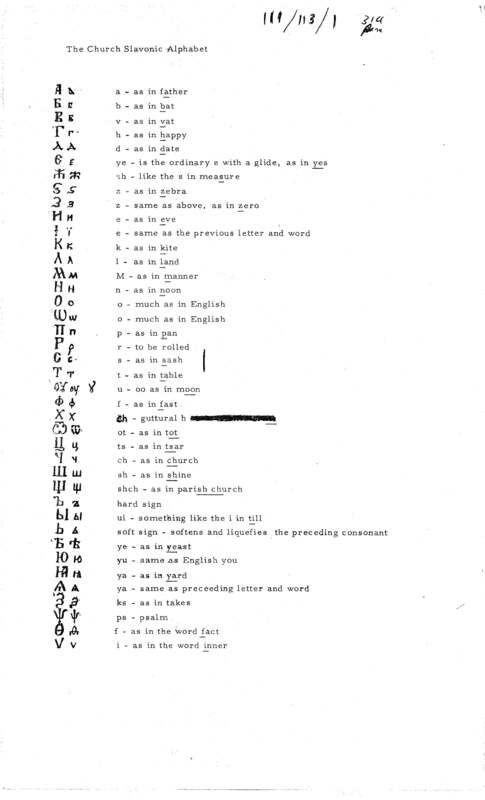 Page one is the system used in the Carpatho-Rusyn tradition. Others provide a helpful reference for the number equivalents of the letters, old style Glagolitic letters and the Russian pronunciation system. Many Church Slavonic books use the old system of letters for numbers. This is also common in Greek and Hebrew. These guides can help read the Psalm numbers and page numbers. Also included is a copy of the Grigassy transliteration system. When you find a prayer book using Latin letters instead of Cyrillic this guide can help you reverse the words back to Cyrillic in order to find them in a lexicon. Jesus Prayer: This file is a scan of a beautifully typeset Church Slavonic version of the Jesus Prayer. Page two is a copy of the Rusyn pronunciation guide. Rusyn Lessons: This is a series of type written lessons in spoken Rusyn (about 100 pages). This class was no longer taught during my time at SS Cyril and Methodius. But this series of lessons for learning spoken Rusyn may be of help and interest. Lunt, Horace Gray. Old church Slavonic grammar. Vol. 3. 5th ed. Slavistic printings and reprintings. ‘s-Gravenhage: Mouton & Co., 1968. This is the standard classic grammar in English for Old Church Slavonic. The work is short (143 pages) but well organized and nicely setup. The charts of declensions and conjugations are clean and well done. The discussion of points is brief, but all are illustrated with specific examples. The pronunciation system presented is by the Russian standard. Gamanovich, Alypy. Grammar of the Church Slavonic language. Translated by John Shaw. Jordanville, NY: Holy Trinity Monastery, 2001. Originally published in Russian, this is an English translation. The grammar is detailed and well organized (400+ pages). All points are supported by multiple examples. The organization and typography make this an easy read. The tables of declensions and conjugations are clean and well organized. This is really the only grammar of Church Slavonic as opposed to Old Church Slavonic available in English. Pronunciation is based on the Russian standard. Gardiner, S. C. Old Church Slavonic : an elementary grammar. Cambridge: Cambridge University Press, 1984. This short grammar states at the outset that he depends on Lunt as the source. From this source he expands the discussion on language pronunciation history. He also adds some short reading texts and a vocabulary section at the rear of the book. Nandris, Grigore, and Robert Auty. Handbook of Old Church Slavonic: Old Church Slavonic Grammar. Vol. 1 London East European series. Group I Descriptive grammars. London: University of London, 1959. Auty, Robert. Handbook of Old Church Slavonic: Texts and Glossary. Vol. 2 London East European series. Group I Descriptive grammars. London: University of London, 1968. This two part set is a short grammar in part one supported by sample texts and glossary in part two. This is a less comprehensive grammar view than Lunt but the two volumes as a pair are useful study collection. The texts and glossary support the discussion of grammar topics. Pronunciation is based on the Russian Standard. Schmalstieg, William R. An introduction to Old Church Slavic. 2nd ed. Columbus: Slavica Publishers, 1983. This is a longer grammar (300+ pages) that also includes sample readings, glossary and bibliography. This seems to be designed as an all in one reference book for beginning study. But this is not quite a text book organization, but a traditional grammar organization with some introductory material and readings. The explanations of grammatical points are more extensive than Lunt’s grammar. A large part of the expansion over Lunt is a concern to place OCS in the context of Proto-Indo-European linguistics, especially in regard to pronunciation trends. The introduction and history are well worth the read as well. They typography is second rate. There is a mixture of Cyrillic and transliteration throughout. And there are several pages of correction at the end instead of correcting the text in this second edition. Be sure to consult the list of errors when using this grammar and mark your own copy accordingly. The glossary is strictly transliteration. Pronunciation is based on the Russian standard. The bad news is there is very little in English in the way of lexicons for Church Slavonic. You will have to deal with Russian, Ukranian, German or Latin for the main available volumes. There are sporadic volumes in other languages as well. But English is a long distant cousin with no clout yet. D’Iachenko, G. Poliii Tserkovno-Slavjanskii Slovar. Moskva: Moskovskogo Patriar’ata, 1993. This dictionary from Old Church Slavonic to modern Russian, is the largest single volume I have seen. Many entries contain sample usage and often the Greek word that the Church Slavonic term translates. Anyone interested in Septuagint Old Testament studies will appreciate this feature. If you use this volume, don’t miss the updated entries typeset in the rear of the book. They contain over 200 pages of updated and additional entries. My only quibbles are the type is small and there is no room to write in the margins. But the book is already over 1100 pages so I suppose that would be asking a lot. Deschler, Jean-Paul. Kleines Wörterbuch der kirchenslavischen Sprache : Wortschatz der gebräuchlichsten liturgischen Texte mit deutscher Übersetzung, Tabelle des kyrillischen Alphabets mit Angabe der Aussprache, Verzeichnis der Abkürzungen in Handschriften und auf Ikonen. Vol. 206 Slavistische Beiträge. München: Otto Sagner, 1987. This is a very nice German lexicon of Church Slavonic. There is a thirty-page section of titla listed in the back as well. Kamensky, VM, ed. Church Slavonic-Russian-English Dictionary. South Canaan, PA: St. Tikhon’s Seminary Press, 1991. This is a short (40 pages) booklet, more of a glossary than a dictionary. This does give English definitions, but they are short and the vocabulary included is very small. I have not had a lot of luck with this dictionary. Most of the words I have needed to look up are not here. However, this is probably a good resource for a starting vocabulary builder. Lysaght, T. A. Material towards the compilation of a concise Old Church Slavonic-English dictionary. Wellington: Victoria University Press with Price Milburn, 1978. Lysaght, T. A. Old Church Slavonic (Old Bulgarian)-middle Greek-modern English dictionary. Wien: B. Hollinek, 1983. Miklosich, Franz. Lexicon palaeoslovenico-graeco-latinum : emendatum auctum. Aalen: Scientia Verlag, 1963. A Church Slavonic lexicon that “helpfully” supplies the Latin and Greek word equivilents for Church Slavonic terms. This is a reprint of a 19th century publication. Popovych, I. Damaskyn D., and Kornyliæi I. Pasichnyæi. Malyi tserkovno-slovians’ko-ukrains’ko-anhliiiskyi slovnyk. Rym: Vasyliian, 1962. This promises to be a Church Slavonic-Ukranian-English lexicon. I have not been able to lay my hands on one to verify the utility or size of the vocabulary included. Sadnik, Linda, and Rudolf Aitzetmüller. Handwörterbuch zu den altkirchenslavischen Texten. Vol. 6 Slavistic printings and reprintings. ‘s-Gravenhage: Mouton, 1955. This German language publication is more of a glossary format. The definitions are very short, usually just a word or two. But the vocabulary included is quite large. There are almost two-hundred pages in two columns of words. Sparwenfeld, Johan Gabriel, and Ulla Birgegêard. Lexicon Slavonicum. Uppsala: Universitetsbibliotek, 1987. This is a five-volume lexicon of Church Slavonic with Latin definitions. There is also a cross-reference system for synonyms in Church Slavonic for the words. Volumes 1-4 are the lexicon proper and volume five is an index to the series. There is also a companion introduction volume detailing the life and work of Johan Gabriel Sparwenfeld who is responsible for the creation of the collations used in this lexicon updated and published by Birgegard. 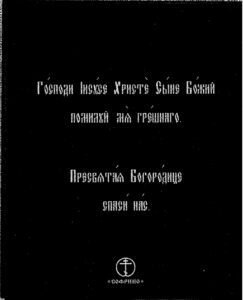 In addition to liturgical books there are a number of other reading sources available in Church Slavonic. Below is a list of reading sources that are either generally available for of some special interest. Altbauer, Moshé, Horace Gray Lunt, and Saint Catherine (Monastery : Mount Sinai). An early Slavonic psalter from Rus’. Harvard Ukrainian Research Institute Sources and documents series. Cambridge: Harvard Ukrainian Research Institute, 1978. This is a photo reproduction of three Church Slavonic manuscript Psalters, Leningrad fragment, codex Sinaiticus Slavonic 6 and the Harvard Psalter. There is a description and introduction to the plates. These three assemble a complete Psalter with the earliest extant text in Church Slavonic (circa 1100). This part two of the grammar mentioned above and has a number of short readings. This is a good introductory primer with a variety of simple readings. Geitler, Lavoslav, ed. Psalterium glagoliski spomenik manastira sinai brda. Zagrebu: Tisak dioniãke Tiskare, 1883. Jagic, Vatroslav. Quattuor Evangeliorum codex glagoliticus olim Zographensis nunc petropolitanus. Graz-Austria: Akademische Druck- u. Verlagsanstalt, 1954. Pogor’ilev, Valerii. Psaltyri. Moskva: Synodal’naja Tipografija, 1901. Psaltir. Lvov: Stauropegial Institute, 1901. Zeedick, Peter Ivan, ed. Psaltir. Homestead, PA: Greek Catholic Union, 1921. This is primarily a Church Slavonic Psalter in Cyrillic. The introduction in Church Slavonic gives the charts assigning the kathismata to the liturgical cycle and a brief description for taking the Psalms. The prayers for beginning the Kathisma reading are here and the prayers after each Kathisma, all in Church Slavonic. The Psalms are divided into the Kathisma and stations. There is a parallel column English text for the Psalms printed in the main text. The English is from the Douay translation of the Bible. 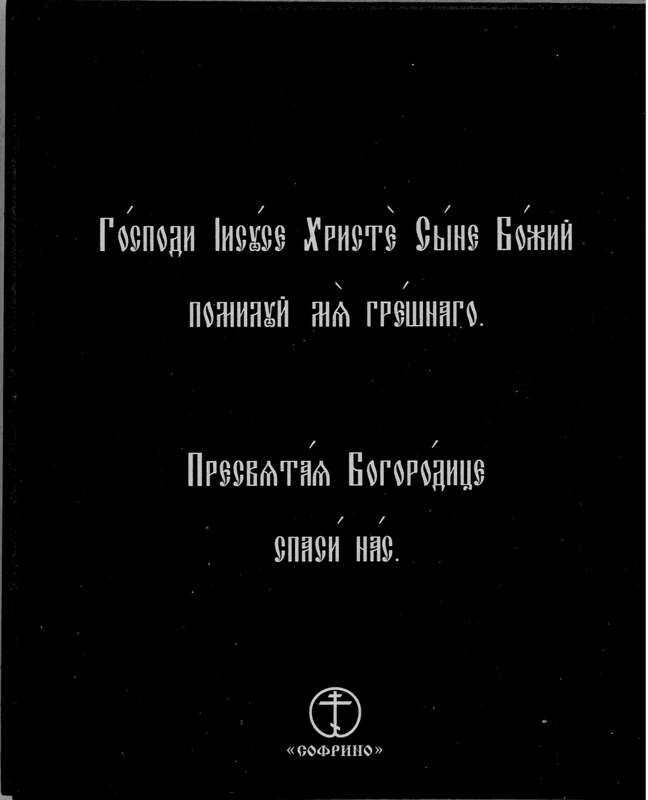 This is a collection of studies about Church Slavonic texts or grammar issues in English. The field is open and growing. If you read German or Russian there is a lot more material available. Birgegêard, Ulla. Johan Gabriel Sparwenfeld and the Lexicon slavonicum, his contribution to the 17th century Slavonic lexicography. Uppsala: s.n., 1985. This serves as the introduction to the five volume Lexicon Slavonicum and contains the life and work of Sparwendfeld. Cooper, Henry R. Slavic Scriptures: the formation of the Church Slavonic version of the Holy Bible. Madison, WI: Fairleigh Dickinson University Press, 2003. An in depth and up-to-date study of the Church Slavonic textual transmission in sacred scripture. Gove, Antonina Filonov, and Orthodox Eastern Church. The Slavic Akathistos hymn : poetic elements of the Byzantine text and its Old Church Slavonic translation. Slavistische Beitrèage ; Bd. 224. Mèunchen: O. Sagner, 1988. This is a fairly in depth study (almost 300 pages) of the metrical and poetic structure of the Church Slavonic translation of the Greek Akathist hymn to the Theotokos. The appendix includes a side comparison of the original Greek text and the transliterated Church Slavonic text. This is a careful look at metrical and textual variants in the Church Slavonic text and how the Greek may have driven those translation decisions or adjustments. Lunt, Horace Gray. “The orthography of eleventh century Russian manuscripts.” PhD, Columbia University, 1949. This doctoral dissertation provides an excellent background to the early Church Slavonic manuscript tradition. Orthography is the study of lettering. The relatively small number of remaining manuscripts from the eleventh century makes this study possible. Lunt does a good job of placing these characteristics in context of the language development. Mares, Frantisek Vaclav. An Anthology of church Slavonic texts of western (Czech) origin : with an outline of Czech-church Slavonic language and literature and with a selected bibliography. Slavische Propylaen ; Bd. 127. Munchen: Fink, 1979. This study surveys the Church Slavonic literature indigenous to the regions Rusyns populated. Pugh, Stefan. Testament to Ruthenian : a linguistic analysis of the Smotryc’kyj variant. Harvard series in Ukrainian studies. Cambridge: Harvard Ukrainian Research Institute, 1996. This is a large study of the influences of the predecessor literary language to Ukranian and Belarusian. The study concentrates on the work of Meletij Smortryc’kyj (1578-1633) and the grammar he produced. The language used by Smotrycêkyj does not exactly correspond to any modern Slavic language. This study attempts to establish the relationship of the modern languages to this common ancestor. Rivero, María Luisa, and Angela Ralli. Comparative syntax of Balkan languages. Oxford studies in comparative syntax. New York: Oxford University Press, 2001. This is a collection of seven papers originally presented in 1996 on comparative syntax for Balkan languages. Three of the seven revolve around subjunctive usage. The first paper discusses the difficulties in performing comparative syntax at all. I just checked out your Rusyn lessons typescript. Extremely fascinating. I just published a grammar of Rusyn as spoken in Slovakia, with comparisons to the variants spoken in Ukraine and Poland. Could you tell me the author of this 100-page gem? When was it written? Many thanks in advance, I have loads of questions! I don’t have a firm attribution for the compiler of the lessons material. One student who attended SS Cyril & Methodius in the late 70’s thought they were compiled by Fr. Athanasisus Pekar. I’ve been toying with expanding the Rusyn section with scanned old resources and a bibliography. Please do provide a reference for your book. I have a copy of Magocsi’s “Let’s Speak Rusyn” (Presov) from1976. This is another English resource. I also have a poor condition copy of the 1924 Uzhorod grammar. This was widely used in the language schools in our churches from what I understand. But it is less useful now as it is entirely in Rusyn and Cyrillic.